By now you probably know 2017 was a banner year for access. Notably, Cape Point was open to ORV access for the entire year and for the first time since before 2008. This was great news for everyone who has been drawn to the seashore over the decades due to the allure of the Point. It was also great news to many newcomers to the seashore who made their first visit to see Shelly Island. 2018 got off to a good start also. Over the winter, Shelly Island was absorbed into the Point and resulted in a huge dry area previously covered by water, and some of the best springtime fishing opportunities in years. Visitors were disappointed on May 19 when the National Park Service announced that the Point was temporarily closed to ORV access due to a colony of least terns that took up occupancy on part of the new land. While the same regulations used in 2017 are still in effect, in 2018 the least terns colony is located closer to the ORV route. The buffer zone required by the Resource Management Plan (revised in accordance with the 2014 legislation) overlaps the ORV route and prevents the use of an ORV corridor like the one used in 2017. At this time, the reopening of the Point to ORV access is dependent on the terns. The most likely scenario is that the colony will remain at or near its present location until after the hatchings fledge, likely in mid to late July. The events at the Point over the past two years highlight the access benefits of changes in the ORV rule and Resource Management Plan at the seashore which resulted from the federal legislation passed in 2014, as well as opportunities for further improvement in the future. Three factors allowed Cape Point to remain open throughout 2017. First, the modified resource management plan allowed for the use of ORV only corridors to bypass active nests for the various species under management. The minimum distance between the active nests and the corridor was established based on best available science as required by the legislation. The location of Oystercatcher nests in 2017 were far enough from the ORV trail to accommodate the corridor. Second, the smaller boundaries for some species (such as the piping plover) after hatching but before fledging accommodated the use of an ORV corridor. Thirdly, last year after hatching, the species moved to the west away from the ORV routes rather than interfering with access. What has occurred in 2018 identifies a major opportunity to improve access in the future. As mentioned earlier, the minimum distance between the nesting birds and the ORV corridor is determined based on best available science. Unfortunately, the science available for colonial water birds, such as the least tern responsible for the 2018 closure, is limited compared to what is available for plovers and oystercatchers. CHAPA has discussed this concern with the National Park Service on several occasions including in recent days. Superintendent Dave Hallac has committed to commission a scientific study working with Gordon Myers, Executive Director of the North Carolina Wildlife Resources Commission to specifically analyze the effect of ORV traffic on nesting activities for colonial water birds to determine if smaller buffers are feasible. 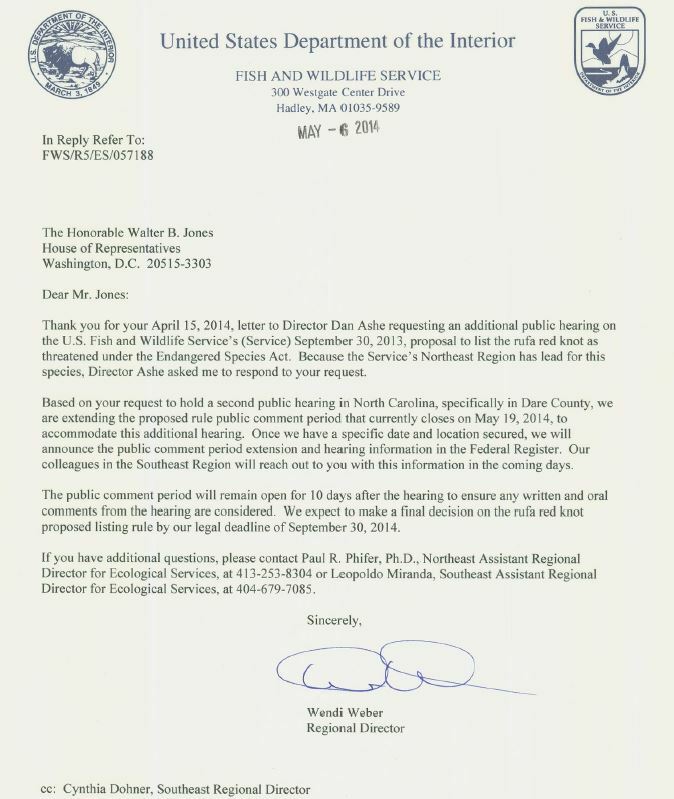 The exact timing of the study is still to be determined, but the park service has already begun the process to identify potential participants in the study and to begin at the earliest reasonable date. The OBPA and our partners work throughout the year to improve visitor experiences in the Seashore. We are in continuous communication with the NPS to manage the challenges with access and develop ideas for future solutions to keep the places we love available for recreational enjoyment. The dynamic nature of our environment and the many factors that have to be considered makes this a difficult task. A solution that worked one year may not work the next. But, as we have demonstrated in the past 18 years, we will not stop trying to tackle these issues and solve problems big and small in the Seashore. For those of you who remember further back than 2016, we have made great improvements in our access. In the summer of 2013, as few as 9.6 miles were available for ORV access in our Seashore. In 2016 and 2017, no less than 25 miles have been available throughout the summer months. Between 2011 and 2015, Cape Point was closed to ORV access by April 9 each year and did not reopen until late August or early September. In 2016, Cape Point did not close until May 11 and reopened on July 27, in 2017 the Point did not close at all. During the same time frame, we have pushed for and received improvements to our ramps and roads, and facilities. We will continue to work with NPS for our visitors, our business community, and our island’s people to keep Cape Hatteras National Seashore Recreational Area a place we can all enjoy. The National Park Service (NPS) is inviting the public to comment on a revision to the rules for off-road vehicle (ORV) use at Cape Hatteras National Seashore. The proposal has been published in the Federal Register, and the public has 60 days to review it and submit comments. The proposed changes include revising the times that certain beaches open to ORV use in the morning, extending the dates that certain seasonal ORV routes are open in the fall and spring, and modifying the size and location of vehicle-free areas (VFAs). The new proposal would also allow the Seashore to issue ORV permits with more varied time periods than currently exist and would change one ORV route designation to allow pedestrian use of an area on Pamlico Sound without the requirement for an ORV permit. This process of updating the special regulation that outlines the rules for ORV use was required by Congress in the National Defense Authorization Act for Fiscal Year 2015. Community input is essential to the development of new regulations, and the public is encouraged to review the draft proposal and send comments that NPS will consider before finalizing the rules. Additional information about the comment period follow. DATES: The public comment period will be open for 60 days. Comments must be received on or before midnight (Eastern Daylight Time) on October 21, 2016. Comments submitted through the Federal eRulemaking portal: www.regulations.gov, or submitted by mail must be entered, or postmarked, before midnight (Eastern Daylight Time) October 21, 2016. Comments submitted by hand delivery must be received by the close of business hours (5:00 p.m. Eastern Daylight Time) October 21, 2016. Comments will not be accepted by fax, email, or in any way other than those specified above, and bulk comments in any format (hard copy or electronic) submitted on behalf of others will not be accepted. Answers to frequently asked questions are available here: https://www.nps.gov/caha/learn/news/16_051.htm. Cape Hatteras Access Preservation Alliance (CHAPA) is offering a $2,500 reward on behalf of the Outer Banks Preservation Association (OBPA), North Carolina Beach Buggy Association (NCBBA), and Cape Hatteras Anglers Club (CHAC) for information leading to the identification of the persons responsible for the green sea turtle incident last weekend. On the morning of Sunday, August 21, Cape Hatteras National Seashore personnel found a severely injured sea turtle on the beach approximately 0.66 miles north of Ramp 32. The sea turtle, identified as a threatened species Green sea turtle, is believed to have come onto the beach some time in the evening, or night, of August 20 in order to lay a nest in the sand. Turtle tracks led from the ocean to the nesting site approximately twenty feet above the high tide line in an off-road vehicle travel area. The injuries to the sea turtle were so severe that the turtle had to be euthanized by National Park Service staff. If you have information that could help investigators, please call the Dare County Community Crime Line at 800-745-2746 or 252-473-3111. You may also submit confidential tips online at http://darecommunitycrimeline.org/cms/tips. WASHINGTON, D.C. – Congressman Walter B. Jones (NC-3) is taking action to modernize the Endangered Species Act (ESA) in order to prevent the waste of taxpayer money and implementation of unnecessary, economically harmful regulations. This week, Congressman Jones is cosponsoring seven pieces of legislation that would bring transparency to ESA processes and reduce the law’s impact on economic growth. H.R. 1314 – Would prevent special interest groups from bringing unnecessary lawsuits against the U.S. Fish and Wildlife Service – which are settled on the taxpayer dime and often result in action being taken without advice from experts or impacted groups – by amending the ESA to allow input from any person, business, state or local government that would be affected by the settlement of the lawsuit. H.R. 4256 – Endangered Species Improvement Act of 2014 – Would ensure that the federal government counts animals dwelling on both private and federal lands when determining recovery for species listed as threatened or endangered. H.R. 4315 – 21st Century Endangered Species Transparency Act – Would provide transparency in ESA listing decisions by requiring the data used in making those decisions to be publicly available online. H.R. 4316 – Endangered Species Recovery Transparency Act – Would provide transparency in the cost of litigation brought against the U.S. Fish and Wildlife Service (FWS) under the ESA by requiring FWS to report to Congress and make available online the amount of taxpayer money used to respond to lawsuits, the number of employees dedicated to litigation, and attorneys fees awarded as a result of lawsuits. H.R. 4317 – State, Tribal, and Local Species Transparency and Recovery Act – Would require that in making ESA listing decisions, the federal government use scientific and commercial data provided by states, tribes, and local governments that will be affected by the listing, and disclose to those governments what data was used in making the decision. H.R. 4318 – Endangered Species Litigation Reasonableness Act – Would place caps on taxpayer-funded attorneys fees in litigation brought under the ESA, making the law consistent with the Equal Access to Justice Act. H.R. 4319 – Common Sense in Species Protection Act – Would require that before issuing a critical habitat designation, the federal government must publish and make available for public comment a comprehensive analysis, taking into account public and private economic effects on land use, property value, employment, and the provision of public services such as water and power. At the request of Congressman Jones, the U.S. Fish and Wildlife Service within the Department of the Interior has scheduled a public hearing in Manteo extended the official comment period with regard to the designation of critical habitat for the Rufa Red Knot under the Endangered Species Act. The designation of critical habitat can have significant impact on how public land may be used. Dare county has been directly affected by critical habitat designation for the piping plove and for loggerhead sea turtles in the past. Many important public areas within Dare County as well as within other coastal North Carolina counties are included in the proposed designation. The OBPA urges all residents and visitors to become familiar with the proposed regulation and to submit comments. Click this link to review regulatory documents and submit comments prior to the June 15, 2014 deadline. The obpa is a not-for-profit corporation with 501(c)(3) IRS designation. Donations are tax deductible.